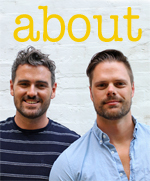 We don't talk about being gay all that much on this blog. Oh, sure, we told you about when we got married. And we've brought you along on some of the great trips we've taken as a couple. It's obviously no secret (to put it mildly) that we're gay. But most of the time, there's just not much of a reason to mention it. There's no gay way to grill a steak, or host Thanksgiving, or bake a pie. We usually talk about food -- why would we mention being gay? But it's Pride month, and we just returned from a weekend in New York City celebrating Pride (and Clay's birthday) with a bunch of friends. So let's talk about Pride. Over the years that we've been writing this blog, we've heard from lots of gay readers and their straight allies who have told us they find support or value in reading The Bitten Word. We've heard from teenagers and twentysomethings who've said that seeing us talk about our lives together has helped give them the encouragement they needed to come out. We've heard from 70-year-old gay men who have marveled at how easily and freely we present ourselves as a couple. We've also, sadly, heard from some older readers who are still in the closet, who tell us they wish they could be as open about themselves as we are. We're not bringing this up to suggest that this blog is special, or important, or anything like that. Quite the contrary. Our point is that we relied on exactly the same kind of support and encouragement in our lives. Maybe instead of a food blog, it was "Will & Grace" or (no joke) "The Real World." And it was also watching gay friends and coworkers and celebrities and politicians living their lives frankly, openly and honestly. Being proud about being gay hasn't always been an easy thing for us at various times in our separate lives. We've both dealt with shame and self-loathing. We've needed to seek reassurance and support from friends. And even when we met back in 2003, we were each dealing with our own issues regarding our level of comfort with being in our own skin, and meshing that with what it means to be in a serious, long-term relationship. It was largely through the support of friends, the examples of others, and the support from each other that we found that comfort. Discussing coming out as a gay man, Dan Savage wrote in his excellent book "The Kid", "Once you realize you're not alone, you realize just how not alone you really are." It's true, and what follows is a powerful sense of community. And it's a community we're proud to belong to. For us, gay pride is about recognizing and valuing that community, that family. It's about honoring the men and women -- from Oscar Wilde to Stonewall to Harvey Milk to Pedro Zamora to Barney Frank to Ellen Degeneres to Tammy Baldwin -- who had such a much harder journey than we did. Thanks to their work -- thanks to them living loud -- our own lives have been made immeasurably better. So if there's some infinitesimal impact of our living our lives openly, we're honored to get to, well, gay it forward. This weekend in New York came at an auspicious time: one year after the Supreme Court's marriage equality decision and two weeks after the Orlando shooting. It was an important reminder that we've come so far in this country, and we still have work to do. We cried multiple times watching the Pride parade this weekend in New York. There were powerful tributes to the Orlando victims, our community emotionally calling for more sensible gun laws, and everyone from nurses to police officers to teachers to a Presidential candidate showing their support of of our community. It was moving and overwhelming. And it was a reminder of how important it is to be proud of who you are. To be yourself and to love yourself, and love others. With that, we'll leave you with this delicious recipe for seasoned sugar snap peas. (Make it! You'll like it. We promise!). Get The Bitten Word delivered to your inbox! Slivered almonds can be used in place of sliced almonds. Do not use ground coriander in this recipe. Toast almonds in 12-inch skillet over medium heat, stirring frequently, until just starting to brown, about 3 minutes. Add coriander seeds and continue to toast, stirring constantly, until almonds are lightly browned and coriander is fragrant, about 1 minute longer. Transfer almond mixture to cutting board. Sprinkle orange zest and salt over almond mixture. Chop mixture until finely minced and well combined. Transfer to bowl and set aside. Heat oil in now-empty skillet over medium heat until shimmering. Add snap peas and water, immediately cover, and cook for 2 minutes. Uncover, add garlic, and continue to cook, stirring frequently, until moisture has evaporated and snap peas are crisp-tender, about 2 minutes longer. Remove skillet from heat; stir in three-quarters of almond mixture and cilantro. Transfer snap peas to serving platter, sprinkle with remaining almond mixture, and serve.